Home Topics Aquatic Invasive Species Alert! PA Fish and Boat Commission News Release - Aquatic Invasive Species Alert! HARRISBURG, Pa. (July 19) – After confirming the presence of the aquatic invasive species (AIS) known as New Zealand Mudsnail (Potamopyrgus antipodarium) in Little Lehigh Creek, Lehigh County, the Pennsylvania Fish and Boat Commission (PFBC) is reminding anglers and boaters that cleaning their gear is the easiest, most effective means of preventing its spread to other waters. PFBC biologists collected Mudsnail specimens this month in Little Lehigh Creek west of Emmaus, PA near the Wildlands Conservancy. 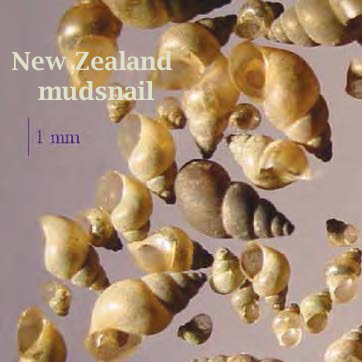 New Zealand Mudsnail expert Dr. Edward Levri of Penn State and PFBC Lead AIS Ecologist Bob Morgan confirmed the identity. New Zealand Mudsnail has spread to Europe, Asia, Australia and North America. They were discovered in the Snake River in Idaho and Wyoming in 1987; in Lake Ontario and the St. Lawrence River in 1991; and in Lake Erie about 4 miles north of Presque Isle Bay in 2007. Additional populations were found in a small stream near the Niagara River in New York in 2008 and in another Lake Ontario tributary in 2011. New Zealand Mudsnails have recently been found in the Gunpowder River in Maryland and in the Musconetcong River in New Jersey (near Riegelsville, PA) which is a tributary of the Delaware River. Anglers and boaters are urged to “Clean Your Gear!” before leaving a waterway and entering another one. New Zealand Mudsnails require some specialized disinfection measures. Gear should be visually inspected and any clinging matter should be removed and disposed of in the trash. To kill Mudsnails, three methods are effective. Gear can be frozen for a minimum of eight hours, or it can be soaked in very hot water with detergent - maintained at 120°F to 140°F - for ten minutes. This last method is not recommended for Gortex®. If you suspect that you have found New Zealand Mudsnail (or any other AIS) in another waterway, please report your information at: http://pfbc.pa.gov/forms/reportAIS.htm. When reporting an AIS sighting it is very important to include as much information as possible including close-up photos of the organism, the exact location (GPS coordinates work best), a description of what you found, and your contact information.